Buy 4, Get 1 FREE! Stainless steel syringes with no removable parts to lose or break off. Standard (gold): larger thumb ring; regular plunger length. Fusion (titanium): thumb ring and finger grips are smaller than "Standard" but larger than "Petite". It's the perfect "in-between" size. 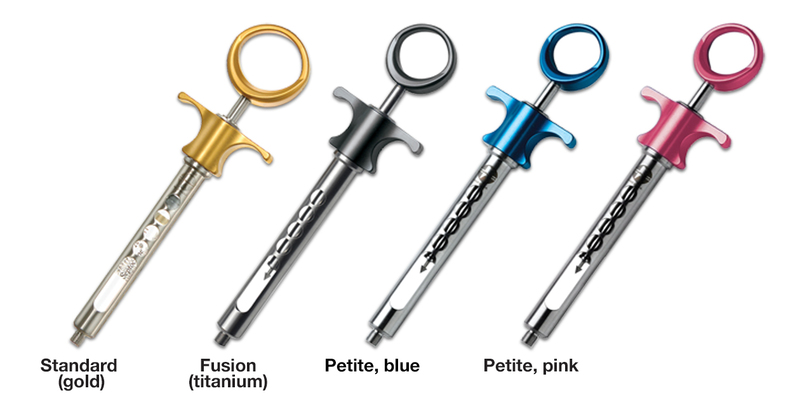 Petite (blue or pink): smaller thumb ring and finger grip, and shorter plunger length than "Standard" or "Fusion". Great for smaller hands.